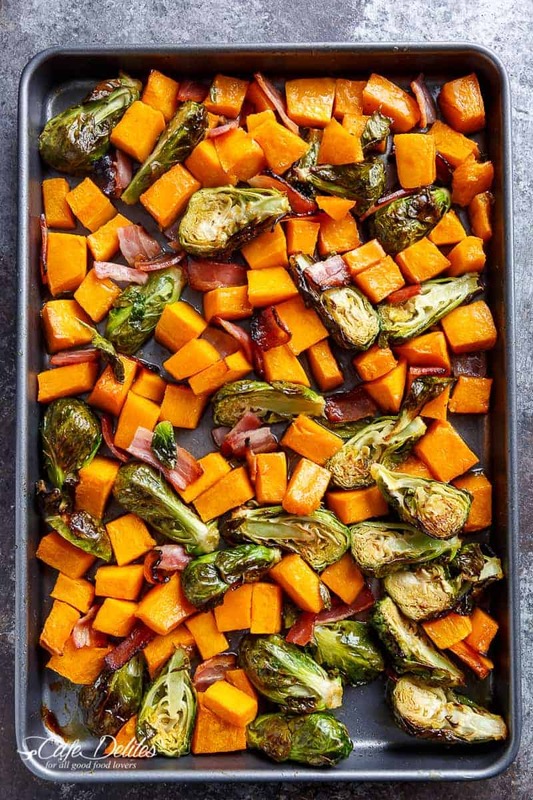 Honey Roasted Butternut Squash & Brussels Sprouts With Crispy Bacon Pieces! 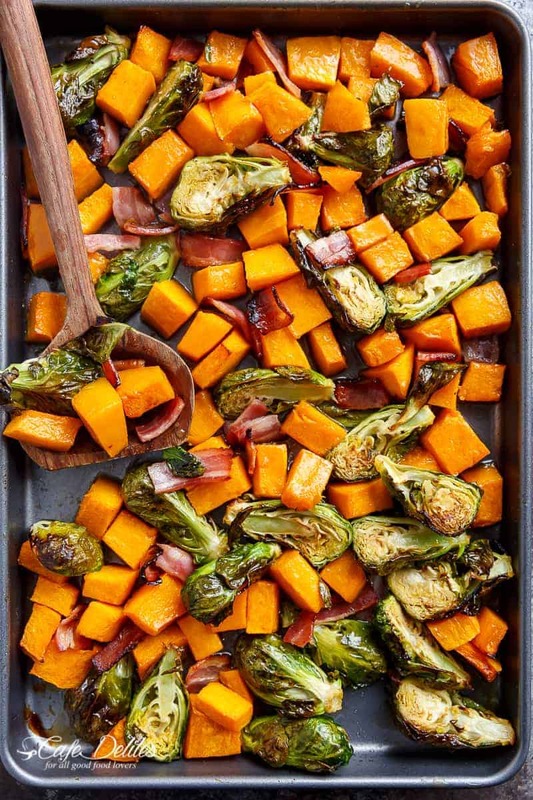 Honey Roasted Butternut Squash & Brussels Sprouts With Crispy Bacon Pieces go so well, so effortlessly! Okay. So I’ll be the first one to put my hand up (well, both hands up), and admit that I normally and usually can’t stand brussels sprouts. Except for this simple and easy 2-extra-ingredients recipe! Pair them with team butternut squash; smother them in honey; season with a little salt…and — my favourite part — add some crispy lovin’ bacon. Oh…honey. You. Complete. Me. Normally, sprouts have the taste of bitter sports socks. Not that I’ve ever tasted socks. I’m guessing that’s the closest flavour on earth I can compare them too. Not this time, friends! This is the last of the sides I’m giving you for your Thaksgiving menu planning. HowEVER, TOMORROW as a BONUS, you’re getting a state of the art, feeds a crowd, dessert for breakfast. THEN by Friday all fingers crossed, you’ll be receiving one of the best desserts your eyes and mouths have ever seen and tasted. GET READY TEAM DELITEFUL. BOTTOM RIGHT: Creamy Slow Cooker Mashed Potatoes; BOTTOM LEFT: One Pan Juicy Herb Roasted Turkey & Potatoes With Gravy. 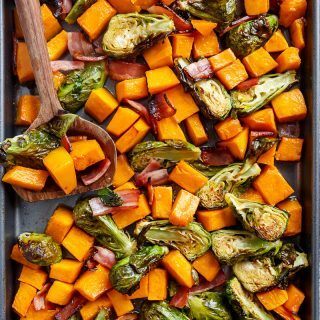 Honey Roasted Butternut Squash & Brussels Sprouts With Crispy Bacon Pieces in a simple 2 ingredient coating for roasting! Preheat oven to 390°F | 200°C. Grease a baking sheet or tray with cooking oil spray, wipe over with a paper towel; set aside. 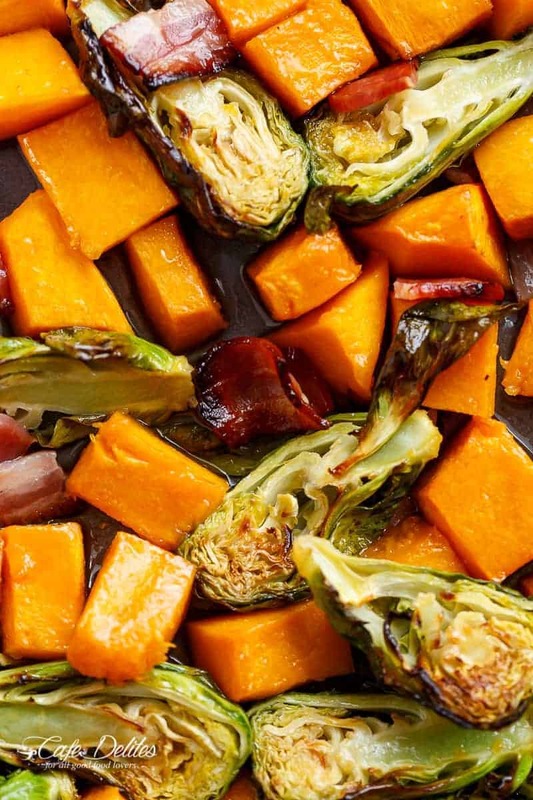 Add the butternut squash and brussels sprouts together on prepared baking sheet. Drizzle with honey and melted butter (or olive oil), season with salt. Toss to evenly coat. Arrange in an even layer and roast for 45 minutes until the sprouts are slightly charred and the squash is fork tender. In the last 10 minutes of roasting time, pan fry the bacon pieces over medium-high heat in a small pan or skillet until crisp and cooked to your liking. Remove squash and sprouts from oven and allow to cool slightly. Taste test at this point and add an extra drizzle of honey if you wish. Mix in the fried bacon pieces. 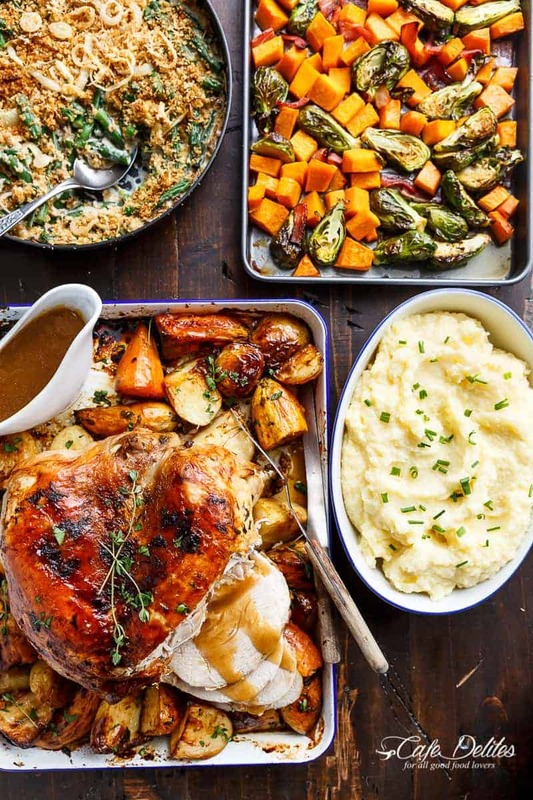 Serve with this Juicy Herb Roasted Turkey, Green Bean Parmesan Casserole, and Slow Cooker Mashed Potatoes. Is that about 4 servings? Sounds delicious! Can this be made ahead of time? If so, what would be the best way to reheat? Hi Kathleen. Yes, the squash and sprouts can be made ahead of time, and the bacon can be fried just before serving! I made this dish for dinner; it accompanied a grilled steak. It was delicious! Thanks for the recioe!